Pie fans had a mouth-watering treat at the weekend when they flocked to the annual pork pie competition. Hundreds of people descended on The Old Bridge Inn in Ripponden to sample and salivate over some of the country's best pork pies. And this year there were 50 entries from butchers and bakers from all over the country. Who battled it out to prove who had the tastiest pie recipe. But it was Huddersfield that brought home the bacon, with previous winner Hinchliffe's Farm Shop in Netherton scooping top prize. 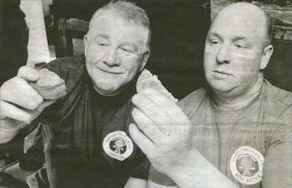 The 17th annual charity competi­tion, organised by the Pork Pie Appreciation Society. Attracted pie makers from as far a field as Southampton, Swansea and Northern Ireland, as well as from all over Yorkshire. 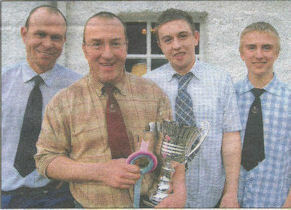 It was Yorkshire pie makers that took all of the top four honours, including Brosters Farm Shop in. Lindley which was placed second. The other runners up were Bentleys of Pudsey and Wilson's of Leeds. Local finalists included Hudders­field pie maker Andrew Jones and E&R Grange Butchers of SlaithWaite. This year celebrity guest judge. pop mogul Pete Waterman, handed Hinchliffe's the top award and described the pies as astounding' with a great taste and subtle flavour,' Owner Simon Haigh said he was delighted to have scooped the top prize again. He said: "It's a great honour. Our pies win lots of trade awards but the Pork Pie Appreciation Society's accolade really means a lot to us and our customers. Pies are rocketing in popularity because they are good wholesome food at the right price. We put a huge amount of care into making our pies not just the I content hut the finished pie crust itself too. The day's main attraction was the hundreds of pies being freshly baked by some of the country's finest. The entrants had to submit four pies per entry and. were also invited to donate pies to be sold throughout the day. Pies and peas were served and there was also an auction of the winning pies Proceeds from this years competition will he donated to the West Yorkshire ambulance appeal which works to make travel possible for disabled, elderly and infirm people. Stuart Booth. one of the organisers and men of the Pork Pie Appreciation Society. said this year's event had been a tremendous Success. He said: "it was an absolutely fabulous day and everyone really enjoyed it it was also a real coup to have a celebrity like Pete Waterman come and take part in the judging. It's always extremely well supported and people come from all over the country from all walks of life to take part. They enjoy coming because it has a very good atmosphere people come and have fun with a drink and a pie. 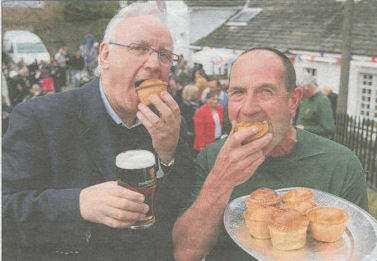 Results of the Annual Charity Pork Pie Competition held at the Old Bridge Inn, Ripponden. 1st. Hinchlffes' Farm Shop, Netherton, Huddersfield. 2nd. Brosters Farm Shop, Lindley, Huddersfield. Other finalists in no particular order. R Grange, Slaithwaite, Huddersfield, Haigh's Farm Shop, Mirfield, Ingfield Farm Shop, Southowram, Halifax; Mellors Farm Butchers, Newark. Thank you for your support, all proceeds this year to the West Yorkshire Jumbulance appeal.Making travel possible for disabled, elderly and infirm people throughout Britain. Tel. 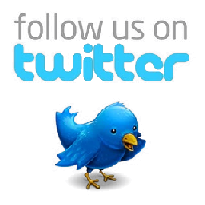 01582 831444.